One of the problems with carbon dioxide is the strength of the carbon-oxygen bond. Potentially, CO2 in the atmosphere could be a valuable source of carbon for industrial processes, which would both reduce its concentration and cut raw material costs. Unfortunately, the CO2 molecule is so stable that it’s very difficult to break its bonds and free up the carbon for reactive chemistry. CO2 activation – the process of persuading oxygen-bound carbon to react – has therefore been a goal of chemistry for some years. A potential breakthrough has now come from researchers at Duke University in North Carolina, US, who have engineered nanoparticles containing the precious metal rhodium that convert CO2 into methane; another very stable carbon compound but one that can be more easily persuaded to react. The methane could be used directly as a fuel or as a feedstock for reaction into further organic molecules. Rhodium has been known as a useful catalyst for organic reactions for many years, and is generally used by heating it. However, over the past two decades researchers have been looking at a field known as plasmonics, which is concerned with the way that metal nanoparticles behave when struck by light. The Duke team, working under Prof Jie Liu, synthesised rhodium nanocubes of some 37nm in dimension, the optimal size for absorbing near-ultraviolet light. Graduate student Xiao Zhang, lead author on the paper, then passed equal amounts of CO2 and hydrogen over the rhodium material. When the reaction chamber was heated to 300°C, the gases were converted into equal quantities of methane and carbon monoxide. But when the heat was removed and the rhodium particles illuminated with a high-power ultraviolet light, the reaction produced methane almost exclusively. 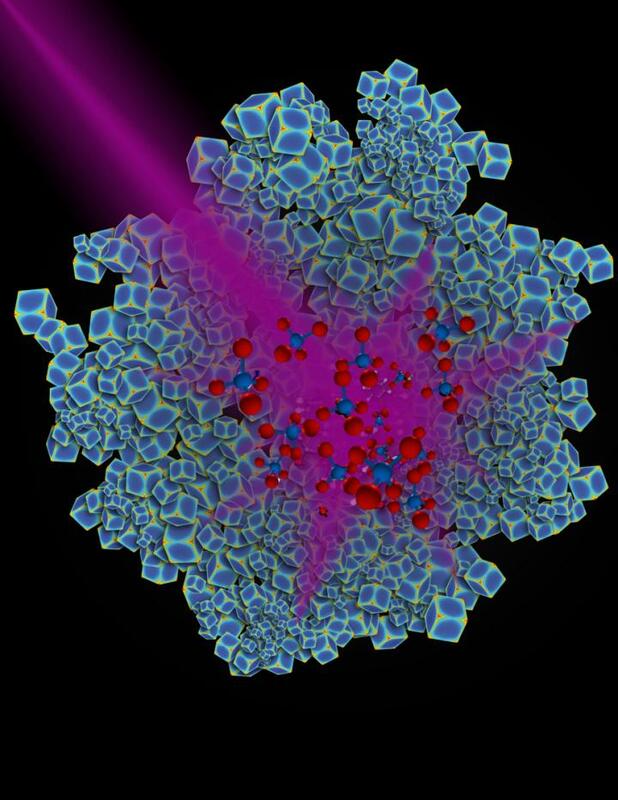 The team now plans to experiment with the size of nanoparticle, to see whether it would be possible to use sunlight to drive the reaction rather than artificially-produced ultraviolet. They are also planning to see whether the plasmonic effect could drive other reactions that are currently performed using heated rhodium metal. This sort of analysis can be applied to many important chemical reactions, and we have only just begun to explore this exciting new approach to catalysis,” said Prof Liu. The catalysis improvement by light is fascinating and must have potential. however, it is hard to believe that there is any good reason to convert CO2 to CH4. Plants fix CO2 using light very well already, and CH4 can be made from the cellulose generated if one wished to, far more economically than reacting with hydrogen at high temperatures.